Liquid jets are often used to cool surfaces because the efficiency is high, and the hardware is simple. These studies aimed to develop a basis for controlled engineering application of such jets. Both experimental and analytical studies have been conducted, leading to relatively complete expressions for the radial distribution of the local Nusselt number beneath an impinging jet. Laminar, turbulent, and splattering jets have each been studied. Because the stagnation-point boundary layers are very thin, the heat transfer coefficients are enormous, sometimes exceeding 100 kW/m2K. In consequence, wall roughness and conjugate heat transfer effects can also have a nontrivial influence. Our current focus is on the cooling characteristics of high Reynolds number jet arrays. Applications of this work include temperature control in materials processing, and cooling of high-efficiency generators, microelectronics, and laser systems. J.H. Lienhard V, X. Liu, and L.A. Gabour, “Splattering and Heat Transfer During Impingement of a Turbulent Liquid Jet,” J. Heat Transfer, Vol.114, No.2, 1992, pp.362-372. 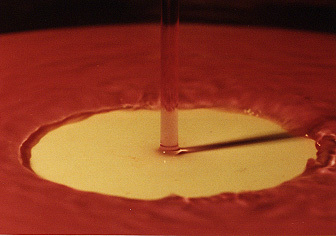 Liquid jets that impinge on solid surfaces often splatter violently, expelling a shower of droplets from the liquid film formed on the target surface. These airborne droplets are indicative of lowered cooling efficiency, lessened cleaning ability, or reduced coating efficiency, depending on the specific application of the impinging jet. Our work has shown that splattering is driven by disturbances on the surface of the impinging jet. Turbulent jets, in particular, develop surface roughness as a result of liquid-side pressure fluctuations driven by the turbulence, and they are thus highly susceptible to splattering. Because practical liquid manifolding and delivery systems create turbulent jets, turbulence is the usual cause of splattering in nonboiling systems. The present work is directed at quantifying the role of nozzle turbulence in producing splatter and at understanding the statistical and spectral evolution of surface roughness on the jets.